H is for hercules, which is the code name for a CIA-operated terrorism database. 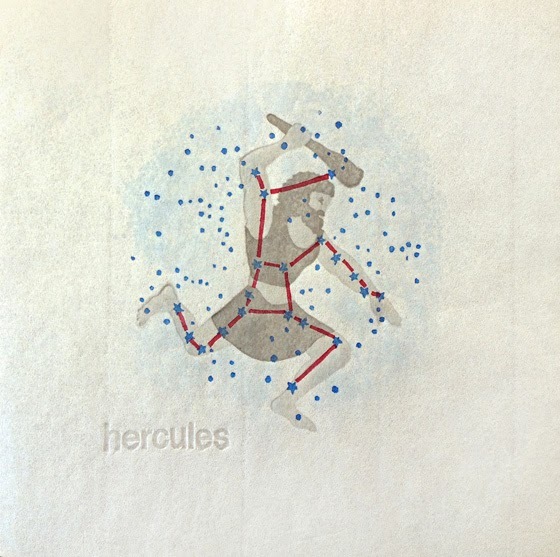 Hercules is also a constellation, a shape usually illustrated by connecting the star-dots. After 9/11, the Bush administration and intelligence agencies were criticized for having all the information they needed to uncover the 9/11 attacks (especially the "Bin Laden Determined to Strike" memo) but failing to "connect the dots." Their response was to collect even more dots and, in the climate of fear in the years after 9/11, we and our elected representatives let them do it, or at least let them have power to do whatever they wanted in order to keep us so-called safe. This massive data grab, revealed by Edward Snowden, has been building for a long time. I'm not sure when the Hercules database was first developed, but I found an online reference to it from the year 2000, so it pre-dates the 9/11 attacks. The volume of any database doesn't matter much. That, by itself, doesn't get you anywhere… The key is knowing what to look for, how to bring together different bits and scraps of information that—on the surface and in an ocean of data—don't appear to be connected. This is hard stuff. Hard stuff indeed. I mean, if somebody didn't draw it out for you, would you see Hercules in that cluster of stars? I wouldn't. And even now, having made this print based on the traditional mapping of the Hercules constellation, what I see is a guy trying to swat a swarm of flies with a baseball bat. Now that I think about it, that's not a bad metaphor for what the U.S. started doing when we declared war on Terror. G is for genie. Genie is an NSA program for accessing foreign computer systems. An August 2013 article in the Washington Post describes the program as an extensive effort by which "U.S. computer specialists break into foreign networks so that they can be put under surreptitious U.S. control." In other words, genie is a program to install malware. Like Stuxnet. Remember that? A couple of years ago, hackers 'discovered' Stuxnet, a military-grade cyber weapon that was used against Iran's nuclear centrifuges. I recall news stories warning that hackers could replicate the code and do all sorts of malicious damage with it. Well, it's pretty clear now that Stuxnet was developed by the U.S. and Israel. There's a saying that it's hard to put a genie back in a bottle. This is true on so many levels when it comes to the NSA spying issues. Malware can't be put back in the bottle. The Snowden revelations can't be put back in the bottle. And our personal data can't be put back in the bottle either. The genie is all the way out of the bottle. 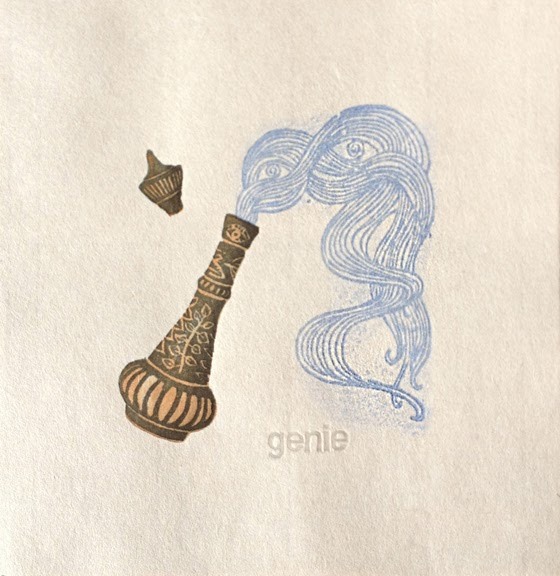 When I started working on this one, I first thought of the genie in Disney's Aladdin, but that genie came out of a lamp, and my genie definitely needed to be in a bottle. So I started looking at the bottle from the 1960s television show I Dream of Jeannie. The 1960s were full of television shows that were about space, technology, and/or spying during the cold war and I Dream of Jeannie was part of that genre. 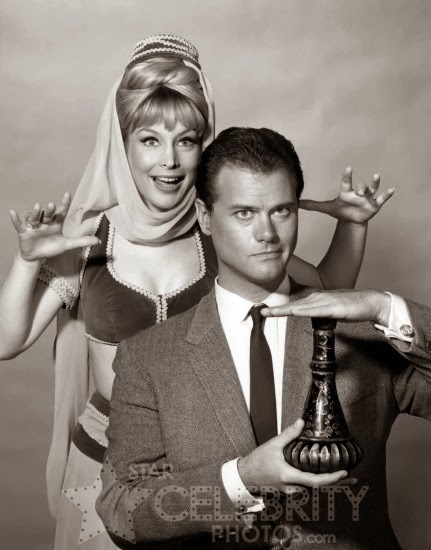 Jeannie (played by Barbara Eden), a 2,000-year-old Persian speaking genie, was found by Captain Tony Nelson (Larry Hagman), a U.S. astronaut, when he splashed down in the South Pacific. Much of the show's drama revolved around Tony trying to keep his Jeannie a secret so that he wouldn't lose his job and his security clearance. The first season of I Dream of Jeannie was filmed in black and white, and the bottle from that season was a dark, smoke-green color, with a painted gold leaf pattern. I used this original bottle rather than the later purple/pink one for its more aged and serious appearance. Apparently the bottle was actually a special Christmas 1964 Jim Beam decanter; you can read a whole Wikipedia article about the I Dream of Jeannie bottle here. Boy, they're not kidding with the fishbowl imagery. 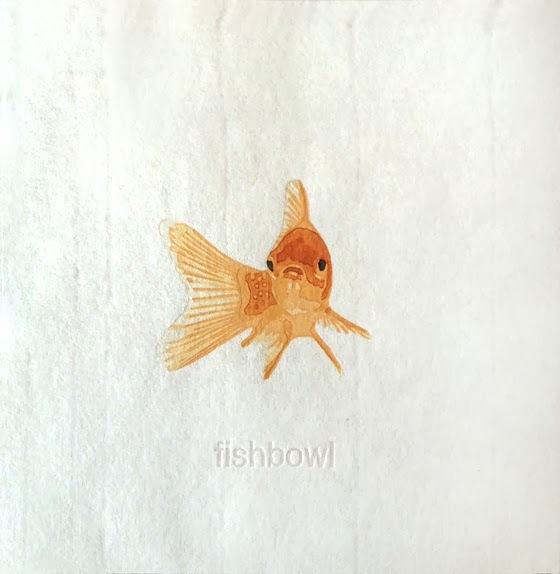 I started this piece with a fish in a bowl, but then I realized that the bowl was unnecessary because it's all a fishbowl, no matter where we go. We leave little data trails everywhere -- our cars, our phones, our laptops. Just try to jump out. The NSA's fishbowl project isn't really about surveillance, though. It's a mobile phone architecture that can provide Voice over IP (VoIP) capability secure enough to be approved for transmitting classified information. The interesting thing about fishbowl is that the secure connection is created using only commercial grade products. That means that even you and I could do it! If we knew how, that is. I'd also like to note that this is my first mokuhanga fish. I don't think one can really consider oneself an artist in the Japanese woodblock tradition until one has printed a fish, so I feel that I've crossed a threshold. This fall I did an illustration for a book cover for University of Chicago Press, and the book is finally out. 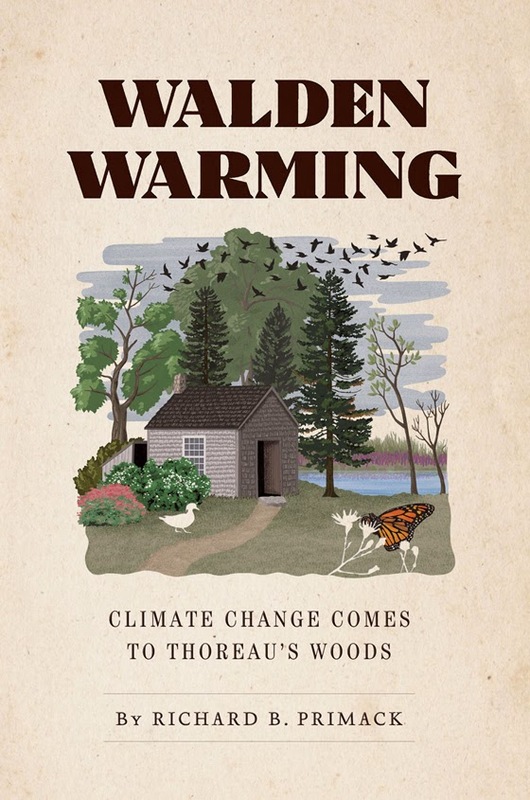 Titled Walden Warming, it's a popular-science book that compares the meticulous notes that Thoreau made in the mid nineteenth century with current field research on the flora and fauna at Walden Pond in Concord, Massachusetts. 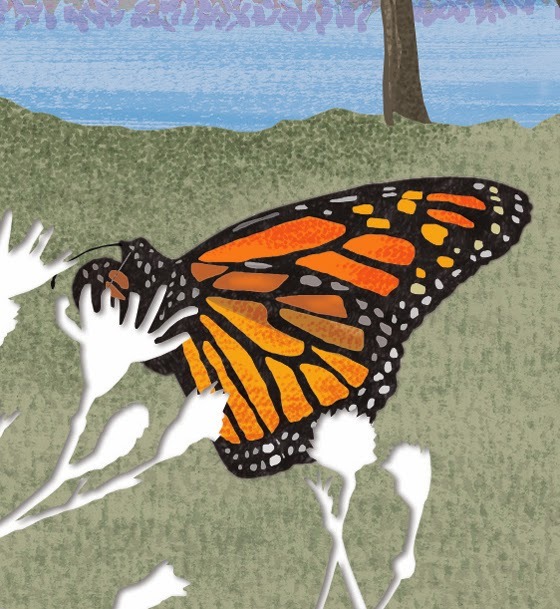 The author, Richard Primack, and his students at Boston University have discovered that 27% of the plant species that Thoreau documented have now disappeared from the area, and another 36% are in imminent danger of disappearing. 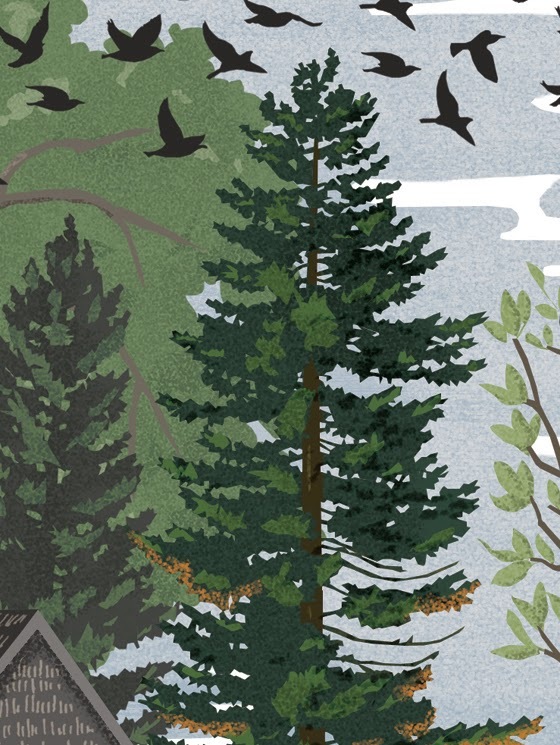 Concord's mean annual temperature has risen by 4 degrees, and the flowers and trees awaken much earlier in springtime than they did 150 years ago. 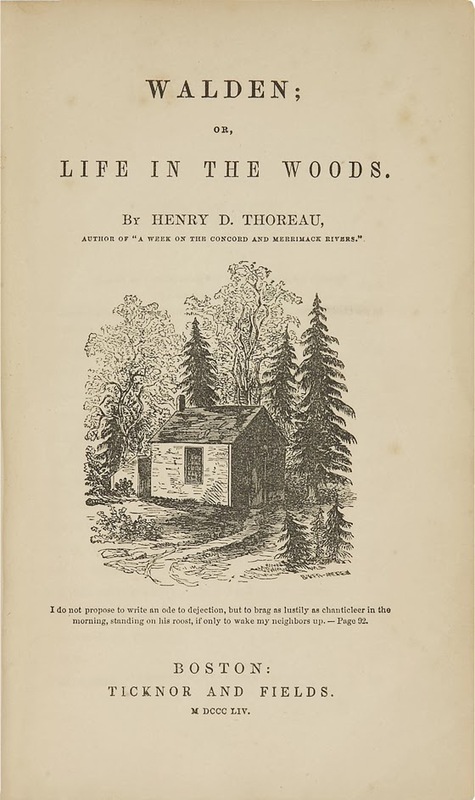 The designer/art director, Maia Wright, wanted to reference the famous title page of the first edition of Walden, which featured an engraving of Thoreau's cabin in the woods. 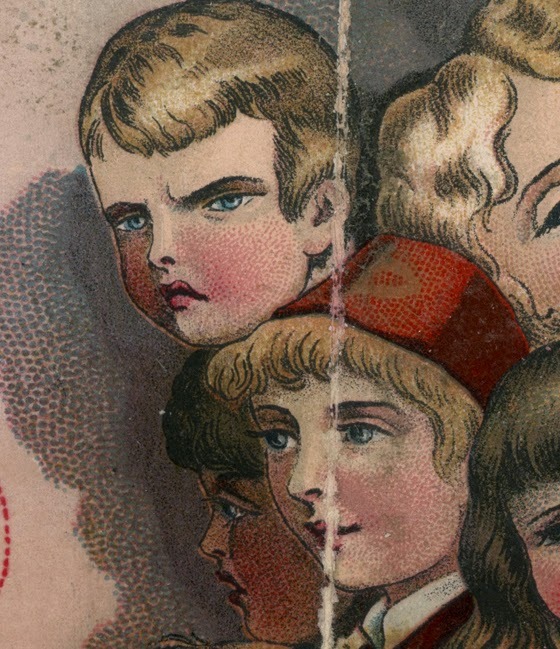 Primack's Walden research reveals three categories of change since the 1850s. One is that some species have become extinct or near extinct, the second is that some 'invasive species' are thriving instead, and the third is that there are now some temporal mismatches (for example, some plants flowering too early for their natural pollinators, or birds showing up too early for the plants they usually feed on). We wanted to show these trends visually but without overstating the case, so we decided to show trees in various phases of leafing, a few invasives (multiflora rose, burning bush, purple loosestrife), nuisance species (starlings) which crowd out natives, and missing species (wood duck and asters). 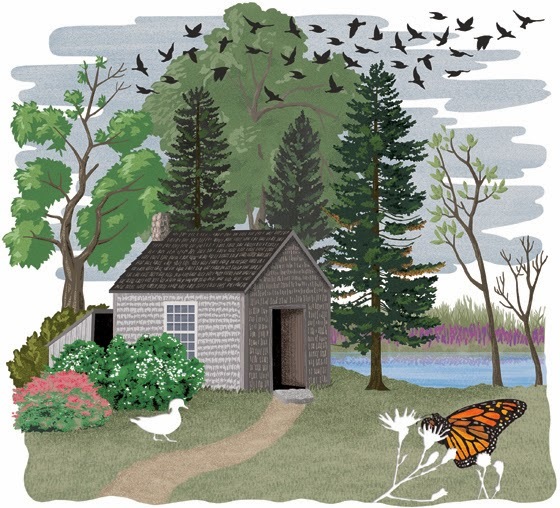 None of these are things that Thoreau would have seen. I used a Photoshop dot pattern as well (you can see it in the shading of the green area above the butterfly) plus some brush strokes that I scanned in and colorized. Somewhere along the way someone mentioned Audubon, so I looked at a lot of those old prints as well. I'm not sure that it looks entirely like an old litho, but the client was very happy with the result, so I was happy too.